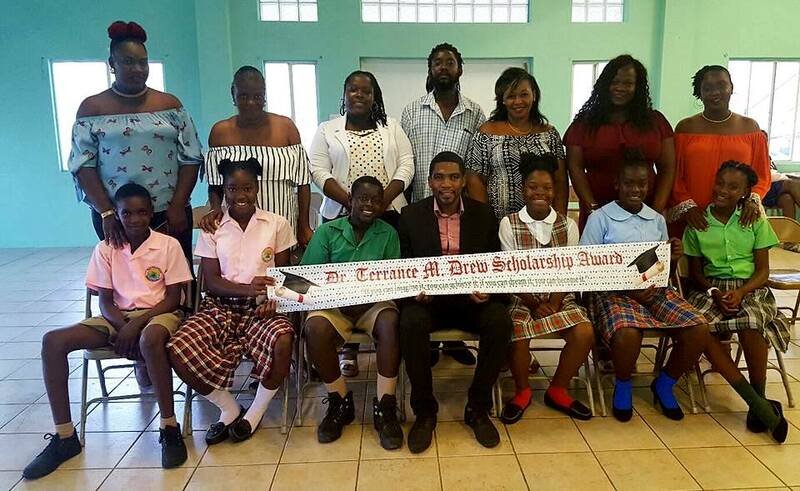 BASSETERRE, St. Kitts (Tuesday, 25th July, 2017) -Community activist Dr. Terrance Drew, on Sunday 23rd July, presented six (6) primary school graduates of Constituency Eight, recipients of the Dr. Terrance M. Drew Scholarship Award, with their gifts during the third annual ceremony held at the Cayon Community Centre. For this financial assistance programme, students are chosen by the teachers of their respective schools fitting categories of ‘Most Promising’ and ‘Most Outstanding’. The 2017 awardees are: Kimmyon Hodge (Most Promising Boy) and Sheniqua Bass (Most Promising Girl) of the Deane-Glasford Primary School; Most Outstanding Student from the Conaree District – Kashara Douglas of the Tucker-Clarke Primary School; Djimon Percival (Most Promising Boy) and Keanna Huggins (Most Promising Girl) of the Cayon Primary School and also Most Outstanding Student from the Conaree District – Kadeja Lewis of the Beach-Allen Primary School. PHOTOS: Dr. Terrance Drew seen with the 2017 scholarship recipients as well as parents and guardians. Dr. Drew expressed that he is “very proud” of the recipients who will go on to continue their academic journey at high school level in the upcoming new school year. In giving some insight into the scholarship programme, Dr. Drew pointed out that students with promise and potential to do well should always be encouraged. Having received their awards, the scholarship recipients expressed words of gratitude to him for such a helpful gesture. Speaking to the parents and guardians, Dr. Drew highlighted the significance of the awardees being selected from among their classmates. He also urged them to do their part in assisting their children to tap into their full potential. Dr. Drew acknowledged that for many parents and guardians, buying school supplies and uniform can be very challenging, especially in a case where there are multiple children to provide for. Dr. Drew, in talking to the children, touched on the importance of hard work and dedication in attaining success in life. Additionally, Dr. Drew told the awardees that on the journey for success, punctuality, regular attendance as well as paying full attention in class are key.